The large building featuring a 15th century façade by architect Michele Sanmicheli (1489-1559) had been abandoned for some time before being carefully renovated thanks to Dino Facchini’s and his family’s passion for art. 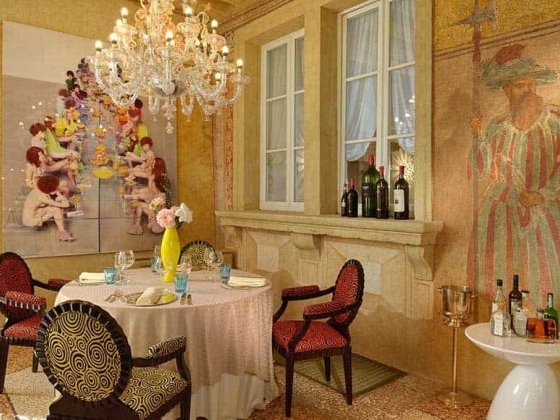 The owners of the prestigious Byblos fashion label, have made accurate renovations both in terms of the architecture and the paintings and décor. Restoration has been carried out on the central and more monumental part of the villa and also on the two towers, the small church dedicated to Saint Rocco and the farm buildings. 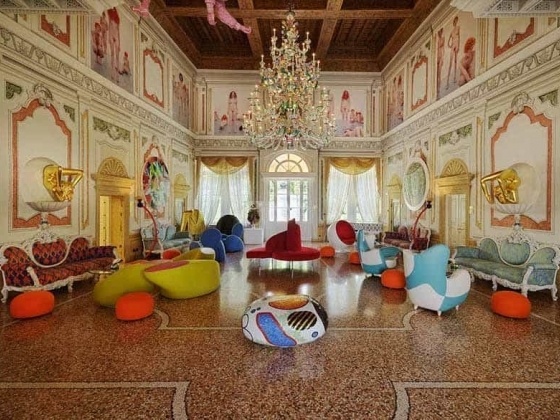 The complex renovation project was completely designed by Alessandro Mendini and his Atelier. 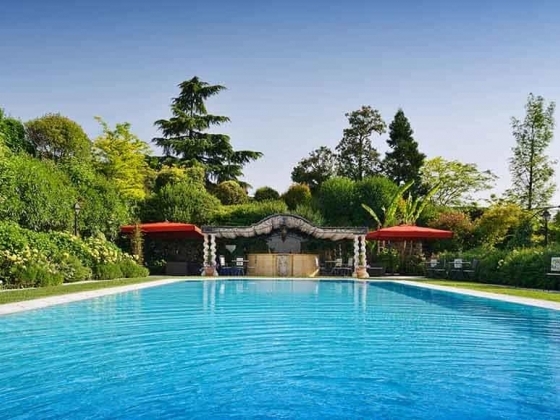 The extensive garden, covering an area of twenty thousand square meters, was designed by Gianfranco Paghera and offers an evocative setting, an “earthly paradise” with fountains and swimming pool, where guests can enjoy a unique atmosphere by smell, sight and touch all the year round. The relaxing “Espace Byblos” spa makes use of the latest scientific advances and offers recovery of fitness, health and wellbeing. The hotel gourmet restaurant “Atelier”, that is also open to the public, offers creative cuisine exploiting traditional specialties as well as international dishes; Peter’s Bar is a pleasant and refined setting dedicated to the American artist Peter Halley, where clients can enjoy cocktails, aperitifs and long drinks accompanied by music and melodies. 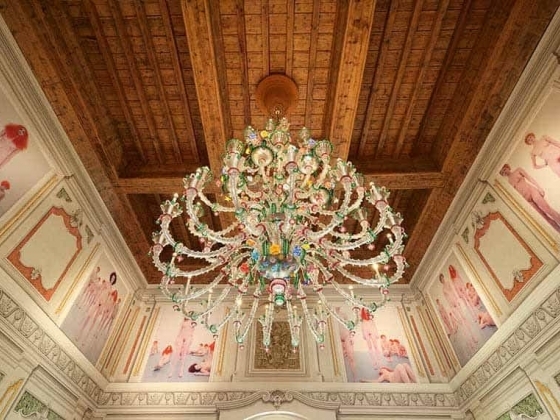 Inside, there is a large hall dominated by a Venetian chandelier and other rooms with elaborate ceiling decorations and murals. There are also two conference rooms and an evocative cellar with a 15th century vault for wine-tasting with more then 500 labels. 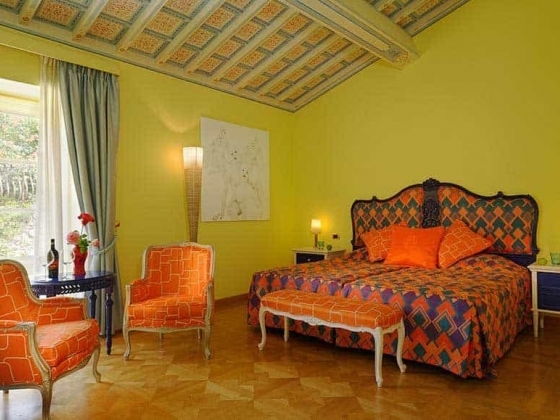 Sixty rooms and suites, with different features and dimensions are available for the guests, including a presidential suite and some artistic suites with carefully designed furniture that are like amazing Wunderkammern. 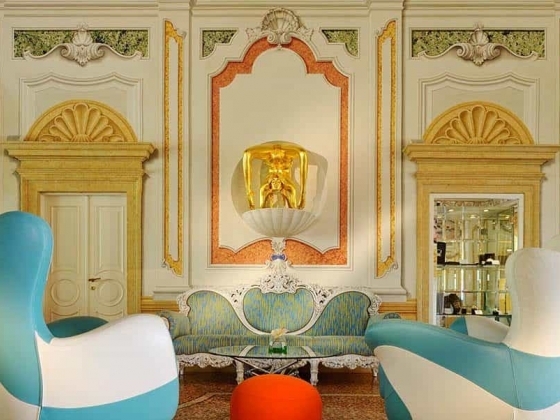 Accommodation: You can have your honeymoon embraced by the charm of Alessandro Mendini's fanciful imagination in the junior suite Mendini's Island and Mendini's Optical or in the Cult suite. Other Features: Our staff expertise and customer care and the collaboration with expert wedding planner help you organizing your wedding reception, taking care of every detail and choosing the setting that best fit to your needs.